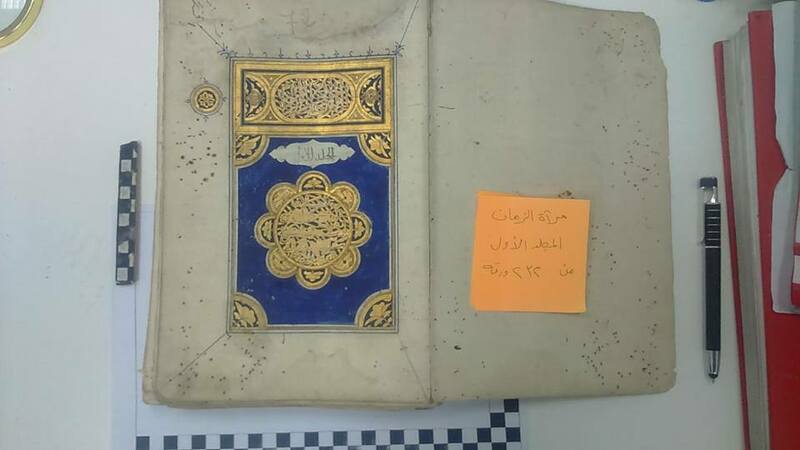 Egypt’s Antiquity Unit, in cooperation with the Egyptian Customs Authority at Cairo International Airport, has succeeded in retrieving a historic manuscript dating back to the 10th Hijri century (Islamic Calendar), according to an announcement on the Ministry of Antiquities official Facebook page. The announcement was made following the manuscript’s confiscation and examination, according to Hamdy Hamam, head of Egypt’s Central Administration of Ports and Archaeological Units. After the manuscript was confirmed as an object of antiquity, the Ministry of Antiquities took the piece in accordance with Egyptian law. The archaeological committee that examined the object recommended that the ministry take quick measures to restore the book, according to Wafaa Wahid, Director General of the Center of Archaeological Units in Cairo Airport. The manuscript is named “Mera’at al-Zaman” (The Mirror of Time) according to Ali Ramadan, head of the antiquity section at the airport. Written by Abi Farag Bin Al-Gawzi, it is considered to be one of the greatest history books of all time, as it addresses pivotal historical events from the beginning of humanity, up until the seventh century. Ramadan added that the book is divided into three separate inked parts, and amounts up to 732 pages. Each page contains different decoration themes, and it was completed on 13 Shaaban 971 Hijri year. Egypt has intensified its retrieval of historical antiquities, foiling several attempts of smuggling. while retrieving antiquities that had been smuggled in the past. In April, Egypt foiled a smuggling attempt of eight ancient Islamic pieces to Lebanon. The previous year, Egypt foiled an attempt to smuggle Khedival-era antiquities to Saudi Arabia, and recovered ancient antiquities from France, Israel, Cyprus and other countries.